Kentuck Knob on the Terrace. Photo by Wayne Stratz, 2005. K is for Kentuck Knob, also known as the Hagan House, in Chalk Hill, PA. 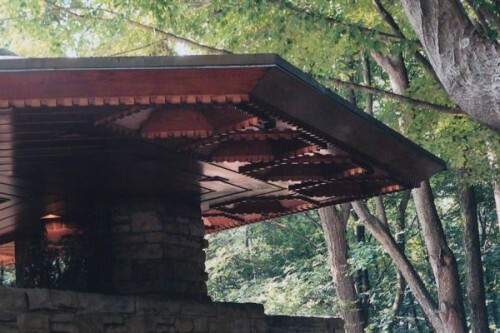 The Hagans knew the Kaufmann’s, owners of Fallingwater, and decided to commission Frank Lloyd Wright in 1956 to design a house for them, Kentuck Knob. To discover that there was another Frank Lloyd Wright house to visit, in addition to Fallingwater, was like winning a prize. 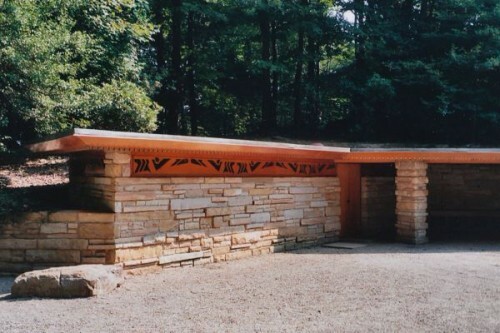 Kentuck Knob, Chalk Hill, PA. Photo by Wayne Stratz, 2005. As wonderful as Fallingwater is, Kentuck Knob is a house that I could imagine living in. One of Frank Lloyd Wright’s Usonian houses, modest, simple, like living on a compact houseboat. The cantilevered overhangs with hexagonal skylights are striking in their toothed texture and leave hexagons of sunlight on the terrace. Kentuck Knob Light through the Porthole. Photo by Wayne Stratz, 2005. On a side note, the house has a carport, a name apparently Frank Lloyd Wright popularized. My grandparents in El Paso, TX, had a carport, which seemed a daring structure, open to the elements. My house in Edmonton, Alberta, had a garage, and we plugged the car in every night to keep the engine warm so it would start on winter mornings. 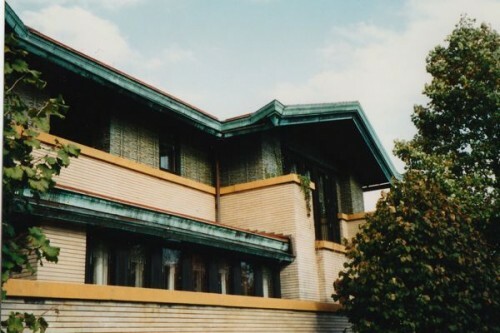 Frank Lloyd Wright designed Dana-Thomas house in Springfield, IL. 1994. Photo by Wayne Stratz. 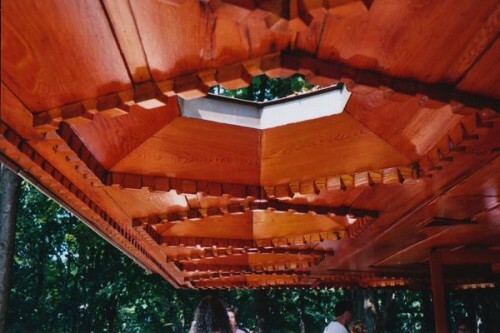 I is for Illinois and being introduced to the architecture of Frank Lloyd Wright. I was attending the Library School at the University of Illinois at Urbana-Champaign, and Stratoz and I took some road trips. The Dana-Thomas House in Springfield, IL was the first time I stepped into a Frank Lloyd Wright house and it was entering another dimension. 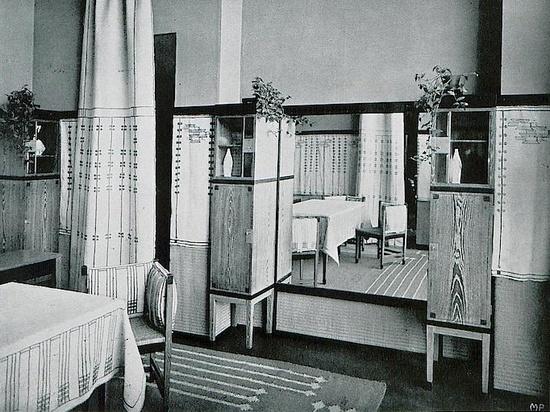 Commissioned by Susan Lawrence Dana, woman of many interests, and in 1902, she asked Frank Lloyd Wright to incorporate her family home, but otherwise let him loose. I am thinking about my one-bedroom-two studio-rowhouse, built in 1900, and how it was a contemporary of the Dana-Thomas house. Stork Motif at Frank Lloyd Wright Home and Studio, Oak Park, IL. 1995. Photo by Wayne Stratz. 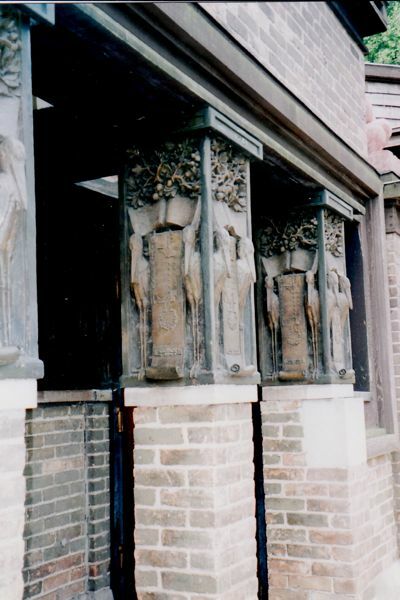 The next summer, Stratoz and I went to Oak Park, IL, and visited Frank Lloyd Wright’s first studio, where he lived and worked from 1889-1909. Having a cat wander over to me as I sat outside was a bonus. 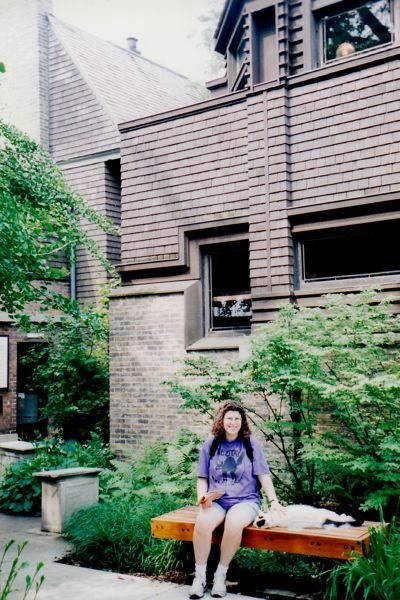 Margaret with friendly cat at the Frank Lloyd Wright Home and Studio, Oak Park, IL. 1995. Photo by Wayne Stratz. Then we headed to the Unity Temple, a Unitarian Universalist Church designed by Frank Lloyd Wright in 1905. The pastor, Augusta Chapin, was a friend of Anna Jones Wright, FLW’s mother. When the old building was struck by lightning and burned down, Frank Lloyd Wright designed a new building entirely of exposed concrete, with no front entrance, and cubist pillars. Unity Temple by Frank Lloyd Wright, Oak Park, IL. 1995. Photo by Wayne Stratz. I would like to have a free architecture. Architecture that belonged where you see it standing – and is a grace to the landscape instead of a disgrace. True ornament is not a matter of prettifying externals. It is organic with the structure it adorns, whether a person, a building, or a park. At its best it is an emphasis of structure, a realization in graceful terms of the nature of that which is ornament. Fallingwater by Frank Lloyd Wright, Bear Run, PA. Photo by Wayne Stratz, 2005. 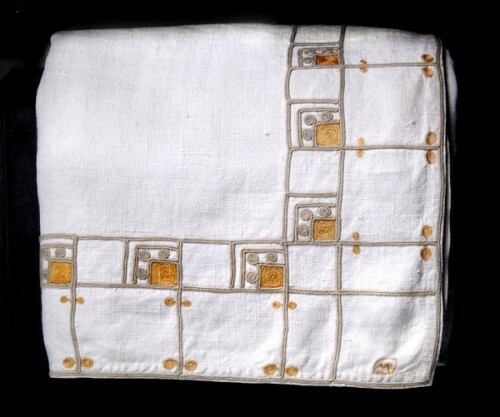 F is for Fallingwater by Frank Lloyd Wright. Stratoz and I took a trip to see it for our birthdays in July of 2005. 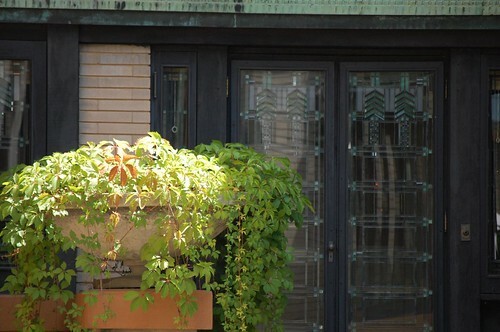 Frank Lloyd Wright’s buildings are a mixture of stubbornness, imagination and delight. A house cantilevered over a stream, practically launched into the water. Wayne Stratz on the grounds of Fallingwater with a Rhododendron leaf, July 2005. 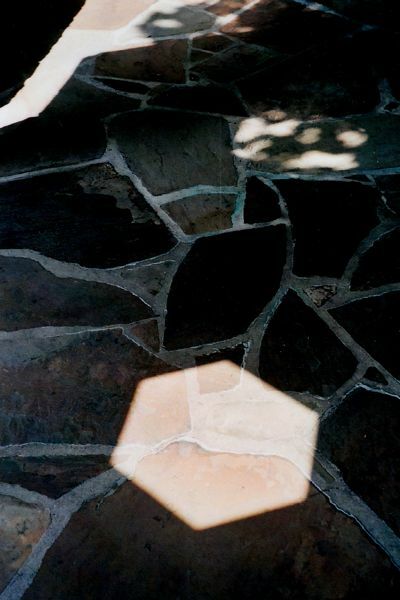 Photo by Margaret Almon. The tour guide told us that Frank Lloyd Wright used yellow ochre throughout the house, inspired by the color of faded Rhododendron leaves from the grounds. Stratoz happened to find a leaf, and it matched his shirt perfectly. Perhaps Frank Lloyd Wright would approve. What buildings have awed you? More images at my A to Z Challenge Pinterest Board. 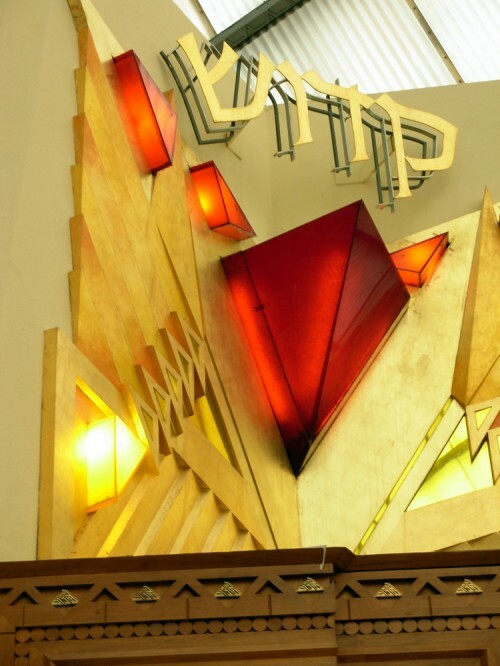 Eternal Flame Lamp at Beth Sholom Synagogue by Frank Lloyd Wright. Photo by Wayne Stratz. Stained Glass Light at the Frank Lloyd Wright Designed Beth Sholom Synagogue. 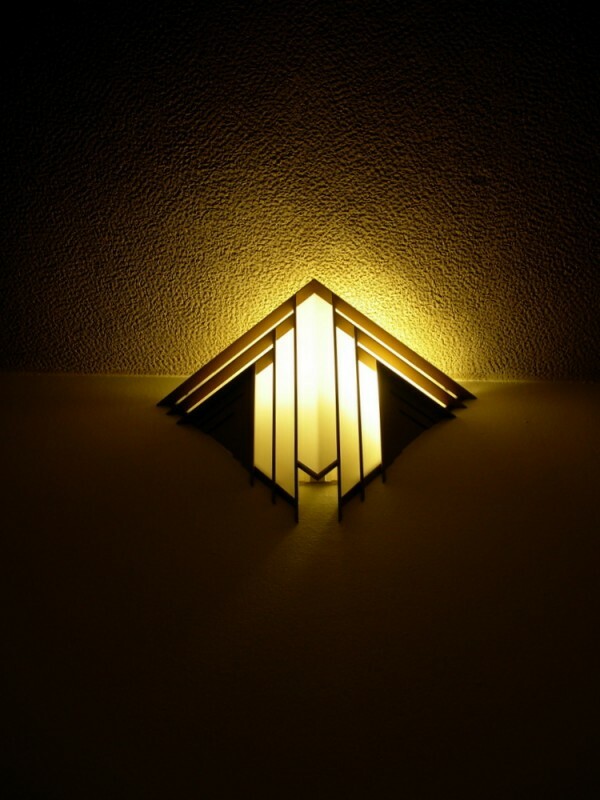 Light Fixture by Frank Lloyd Wright at Beth Sholom, Elkins Park, PA. Photo by Wayne Stratz. 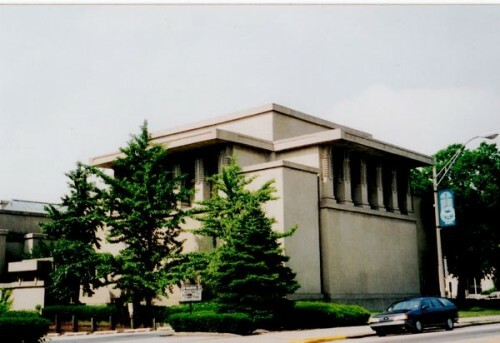 Beth Sholom: Frank Lloyd Wright Designed Synagogue in Elkins Park, PA. Photo by Wayne Stratz. 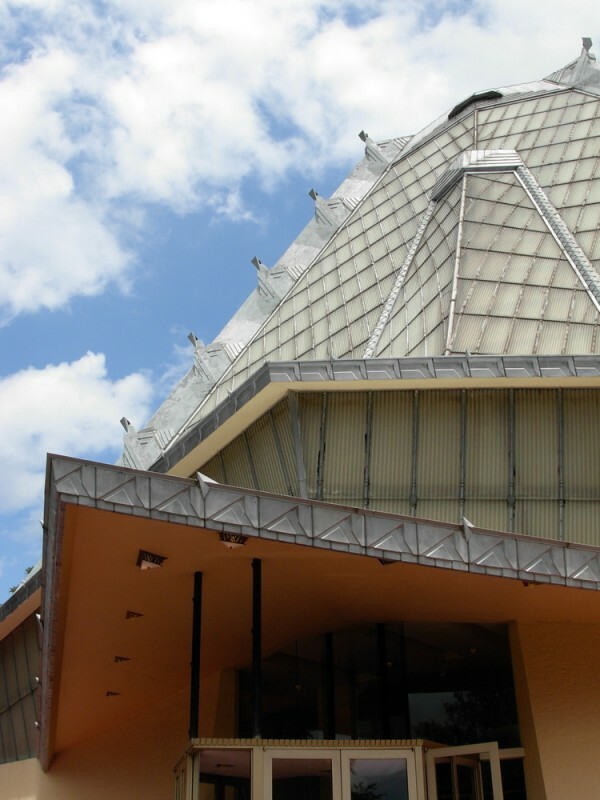 Margaret’s Birthday Trip to the Frank Lloyd Wright Designed Beth Sholom Synagogue in Elkins Park. Photo by Wayne Stratz. Long before I began making mosaics I was drawn to visual wonders, places where art was made, and historic buildings. Moving to the Philadelphia Suburbs, I found some places that delighted me with their creativity. I would absorb the beauty through my pores, breathing it in. Here are 5 to put on your list. 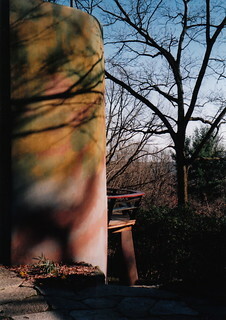 Wharton Esherick’s Silo in Paoli, PA. Photo by Wayne Stratz. Outside Paoli, just west of Valley Forge Park, in the woods, Wharton Esherick’s house sits like a secret waiting to be discovered. The carved wood spiral staircase, the custom made furniture, the peek inside a sculptor’s mind–it’s all good. Guided tours of the Wharton Esherick Studio are available by reservation only. 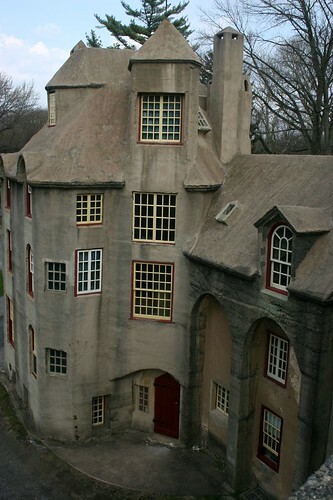 James Mercer, founder of the Moravian Tileworks in Doylestown PA, built himself a mansion entirely out of concrete. It rises up from the grounds like a fairytale crossed with science fiction. 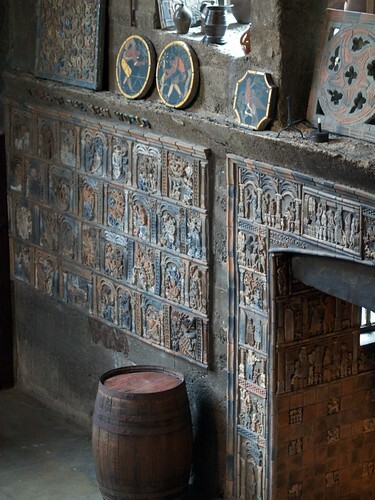 The inside is covered in samples of Moravian Tiles, and Mercer’s collection of tiles and artifacts. There are concrete reading tables at strategic windows so he could follow the sun as it rose and set. This is where Mercer’s tiles were made Doylestown, and it is open for tours, a tile festival in May(which is a tile lover’s dream), a gift shop full of tile goodness, and classes if you are interested in making ceramic tiles. All I knew about Swedenborgians was that Helen Keller was one, but then I moved within driving distance of Bryn Athyn, and discovered the Bryn Athyn Cathedral and the adjacent Pitcairn museum of religious art. 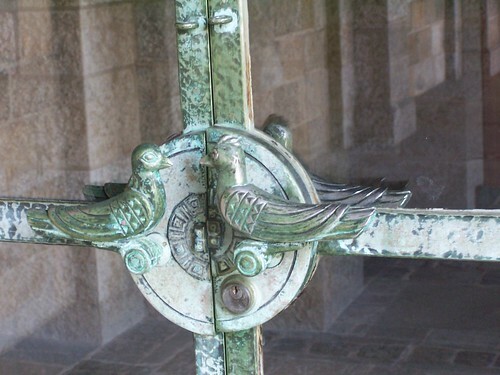 The Cathedral was constructed in a mini reconstruction of the craft guild past with workshops for stone, wood, metal, and stained glass that were built on site by experienced craftsmen. 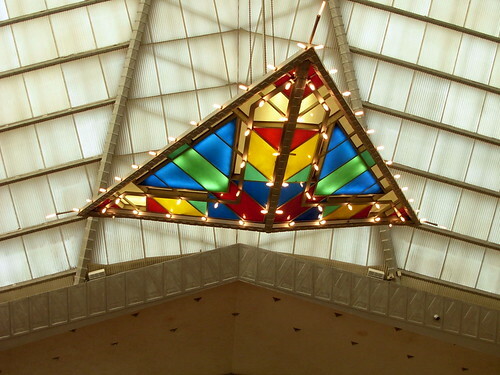 Stained Glass “Basket of Light” at the Frank Lloyd Wright Designed Beth Sholom Synagogue. Photo by Wayne Stratz. The only Synagogue built by Frank Lloyd Wright! Just knowing Beth Sholom is nearby makes me happy. I’d love to hear about more art places in the Philadelphia area! A Gathering Together: Collecting Pennsylvania Craft and the Legacy of Henry Chapman Mercer. Wharton Esherick and the Pennsylvania Legacy of Wordworking. 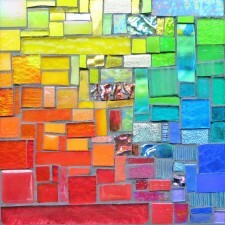 There’s something about mosaics that draws people. I came across these photos of mosaics made by the playwright(among other things, including Congresswoman) Clare Booth Luce, which she gave to Frank Lloyd Wright at his Arizona home Taliesin West. Through the wonders of interlibrary loan, I checked out Jenkin’s book on The Art of Making Mosaics from 1957. Her daughter Barbara Mills was a co-author, and together they have many observations that rang true. Perhaps handling these stones and glass gave Clare Booth Luce some happiness after the death of her daughter.